February 12, 1294 Kublai Khan, the conqueror of Asia, dies at the age of 80. February 12, 1554 Lady Jane Grey, the Queen of England for thirteen days, is beheaded on Tower Hill. She was barely 17 years old. February 12, 1709 Alexander Selkirk, the Scottish seaman whose adventures inspired the creation of Daniel Dafoe’s Robinson Crusoe, is taken off Juan Fernandez Island after more than four years of living there alone. February 12, 1793 The first fugitive slave law, requiring the return of escaped slaves, is passed. February 12, 1818 Chile gains independence from Spain. February 12, 1836 Mexican General Santa Anna crosses the Rio Grande en route to the Alamo. February 12, 1909 The National Association for the Advancement of Colored People (NAACP) is formed. February 12, 1912 China becomes a republic following the overthrow of the Manchu dynasty. February 12, 1921 Winston Churchill of London is appointed colonial secretary. February 12, 1924 George Gershwin’s groundbreaking symphonic jazz composition Rhapsody in Blue premieres with Gershwin himself playing the piano with Paul Whiteman’s orchestra. February 12, 1929 Charles Lindbergh announces his engagement to Anne Morrow. February 12, 1931 Japan makes its first television broadcast–a baseball game. February 12, 1935 The Macon, the last U.S. Navy dirigible, crashes off the coast of California, killing two people. February 12, 1938 Japan refuses to reveal naval data requested by the U.S. and Britain. February 12, 1940 The Soviet Union signs a trade treaty with Germany to aid against the British blockade. February 12, 1944 Wendell Wilkie enters the American presidential race against Franklin D. Roosevelt. February 12, 1949 Moslem Brotherhood chief Hassan el Banna is shot to death in Cairo. 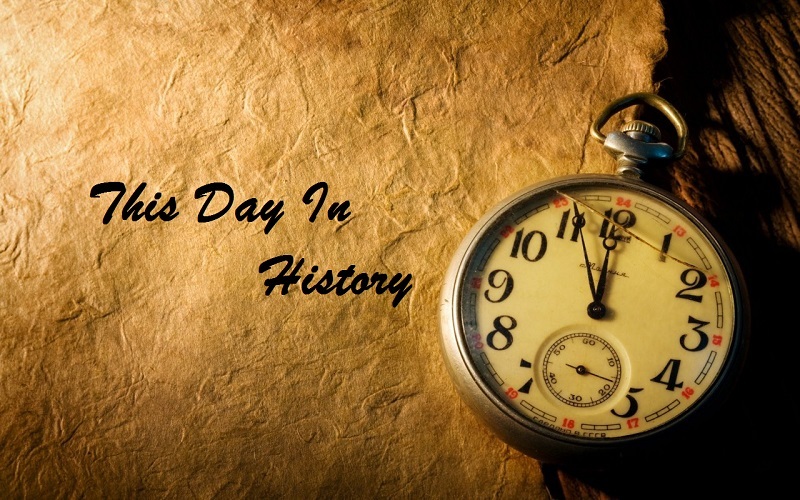 February 12, 1953 The Soviets break off diplomatic relations with Israel after the bombing of Soviet legation. February 12, 1966 The South Vietnamese win two big battles in the Mekong Delta. February 12, 1972 Senator Edward Kennedy advocates amnesty for Vietnam draft resisters. February 12, 1974 The Symbionese Liberation Army asks the Hearst family for $230 million in food for the poor. February 12, 1980 The Lake Placid Winter Olympics open in New York. February 12, 1987 A Court in Texas upholds $8.5 billion of a fine imposed on Texaco for the illegal takeover of Getty Oil. February 12, 1999 The U.S. Senate fails to pass two articles of impeachment against President Bill Clinton. He had been accused of perjury and obstruction of justice by the House of Representatives. February 12, 1809 Charles Darwin, naturalist and influential theorist of evolution (On the Origin of Species by Means of Natural Selection). February 12, 1809 Abraham Lincoln, 16th U.S. President of the United State (1861-1865). February 12, 1828 George Meredith, English poet and novelist. February 12, 1857 Eugene Atget, French photographer, took over 10,000 photographs documenting Paris. February 12, 1874 Auguste Perret, French architect, pioneer in designs of reinforced concrete buildings. February 12, 1880 John L. Lewis, American labor leader. February 12, 1893 Omar Bradley, U.S. army general during World War II.